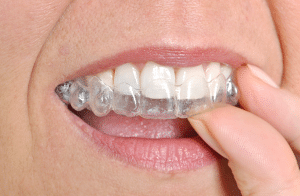 Invisalign eliminates the use of bulky, uncomfortable materials such as metal, wires, and elastics. Clear aligners consist of a smooth, thermoplastic known as SmartTrack material. This material is designed to work exclusively with Invisalign treatment, which allows better control over tooth movement. Unlike traditional braces, Invisalign treatment is clear and removable. Aligner trays are made of lightweight, smooth plastic, eliminating the use of metal brackets and wires. Each set of aligners is custom-made for a perfect fit and maximum comfort. In addition, there are no diet restrictions so you are able to eat the foods you love as well as brush and floss like normal. Invisalign is designed to blend in seamlessly with your everyday lifestyle. The length of Invisalign treatment is different for each patient and typically based on the severity of issues being corrected. As a leading orthodontist in West Orange NJ, Dr. Milestone will determine the length of treatment based on your treatment goals and individual needs. The majority of patients experience minor to no pain throughout their Invisalign treatment. However, there may be slight discomfort when wearing a new set of aligners for the first time. Although, this is only a sign that your treatment is working effectively as intended. Invisalign is composed of smooth, lightweight thermoplastic which eliminates stainless steel brackets for maximum comfort. Invisalign may be a great option for teens as well as adults who seek a virtually invisible way to attain straighter teeth. Both Invisalign and Invisalign Teen enable the possibility to fix most common orthodontic issues including misalignment, overcrowding, and irregular spacing between teeth. In conclusion, Dr. Milestone and our team at Milestone Orthodontics are experts in orthodontic treatment. We are here to answer any questions or concerns you may have regarding Invisalign and Invisalign Teen in West Orange NJ, Union NJ, Verona NJ, Nutley NJ, Caldwell NJ, and the surrounding areas of Essex County NJ. Contact Milestone Orthodontics to schedule a complimentary consultation today. Call now (973) 325-1777.